Teen Mom 2 fans, it really happened! Jenelle Evans married David Eason! The reality star walked down the aisle on Saturday afternoon and made it official! Jenelle and David tied the knot in an outdoor ceremony at their home in North Carolina. 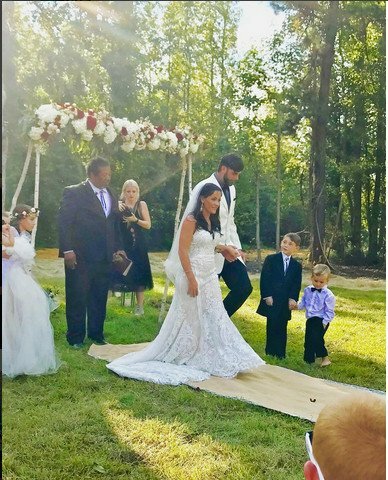 All three of Jenelle’s kids, Jace, Kaiser, and baby Ensley were at the wedding, as well as David’s daughter Maryssa. She kept her word and didn’t invite her mom, Barbara Evans. Jenelle Evans Files Assault Charges Against Courtland Rogers; Plus, Is She Moving On With Ex-fiance Gary Head? The drama that surrounds Jenelle Evans seriously never ends. Today's news: assault charges, moving on with a "good" friend, continued drug abuse claims, and new baby mama drama. Jenelle's attorney, Dustin R.T. Sullivan, told E! News that the Teen Mom 2 star has filed charges – four counts of assault on a female with an unborn child – against soon-to-be ex-husband Courtland Rogers. According to Dustin, Jenelle was "physically assaulted over a period of time" but seems to be "very concerned about her general health and well-being." Facing a maximum 150 days in jail per charge, Courtland tweeted, "She has put me threw [through] hell and back and I ALWAYS been the best man I could for her. I am devastated and my whole family knows I didn't do that." Following a nasty fight on Monday and a pregnancy scare on Tuesday, Jenelle Evans has announced that she plans to divorce Courtland Rogers as soon as possible. Early this morning, the Teen Mom 2 star tweeted, "I am getting a divorce, ASAP. YOU F**KING LEAVE OUT OF TOWN AND I MIGHT BE HAVING A MISCARRIAGE?! F**K U, U F**KING PIECE OF S**T."
Jenelle and Courtland have been married for 51 days and are expecting their first baby together this September. On Monday, Jenelle was "heartbroken in half completely" after she learned Courtland was out partying while she was sleeping. Find Out What Jenelle Evans’ Husband Courtland Was Arrested For! Plus Is Jenelle Addicted To Heroin? Jenelle Evans is a human trainwreck of Lohan proportions that I really wish would fade into obscurity until she cleans up her act. And oh her poor son. In the latest travail to plague the Teen Mom 2 star she married an ex-con in a quickie ceremony and may or may not be in the throes of a serious drug addiction. “Courtland is accused of taking a gift card back to a store and attempting cash it in, but according to the store the gift card was never purchased so that raised a red flag,” a source tells RadarOnline. Before I finish writing one story about Teen Mom 2's Jenelle Evans, 12 more crop up. It's a never-ending battle to see how many words per minute I can type without spraining a pinky. Or a middle finger. Let's start off first with the events of yesterday morning. No, I don't mean the release of Ke$ha's new album, y'all! I'm talking about the day that will now be known as the wedding anniversary of Jenelle Evans' first marriage. Yesterday when Jenelle and Courtland secretly said their "I Do's", they first had to stop by different court room, where Courtland was charged with a felony! A Radar source shared, "Courtland Rogers was charged with a felony in North Carolina on Tuesday for obtaining property by false pretenses. Straight after that court hearing was finished Jenelle and Courtland got married at the magistrate's office." Breaking: Jenelle Evans And Courtland Rogers Get Married! Well that was FAST! After like 12 minutes of dating a 14 day engagement, Teen Mom 2 star Jenelle Evans and Courtland Rogers got married this morning! Coincidentally, Ke$ha dropped her new album today! Oh the devotion Jenelle has for Ke$ha knows no bounds. Jenelle's sister Ashleigh ran to the tabloids the minute she found out the news. It's apparent that these two are still not on good terms. "My sister got married this morning, it was a shotgun courthouse wedding." Um, not sure if Ashleigh really gets what the term "shotgun" means since Jenelle says she is definitely NOT pregnant. Jenelle hasn't "confirmed" the wedding, but she did share on Twitter that she's not preggers again. "NOOO I'm not and Courtland did not say anything about getting me pregnant or having kids anytime soon. Over my dead body if I would be that selfish to have a baby before getting Jace back."